Elek Book covers – The original 1950s editions often had garish pictures on their covers as with ‘His Excellency’. The more plain covers are from the 1970s reprints. 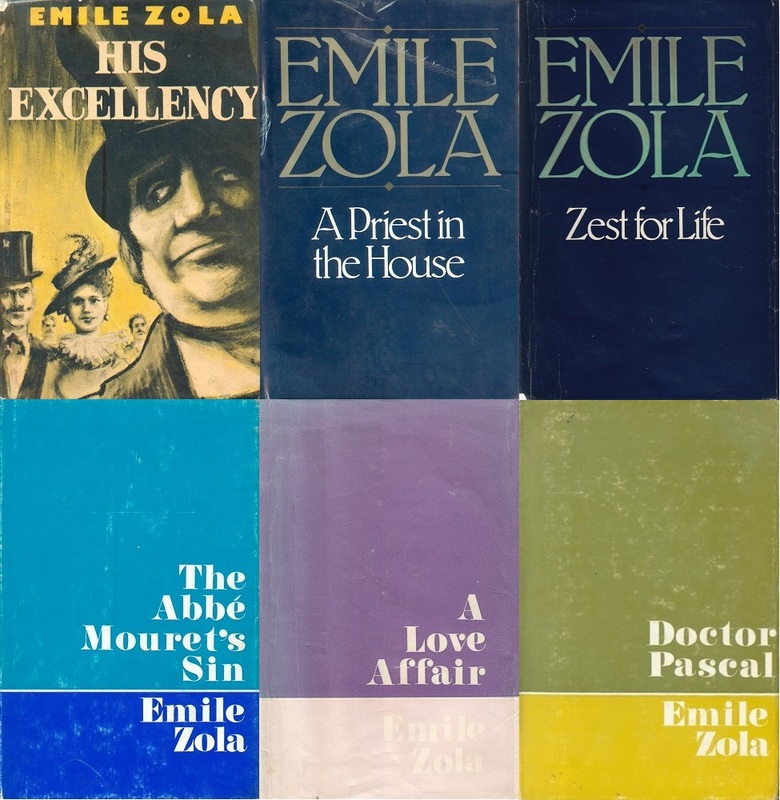 When I was reading the Rougon-Macquart series I came across Graham King’s book Garden of Zola, in which I discovered that a large portion of Zola’s books were translated in the 1950s and 1960s. As I had realised by this time that not all the R.M. books were available in newer, more readily available translations and that the older Vizetelly translations were not necessarily the best versions to read, I decided to search for some of the Elek books. I found some in my County Library’s store and some I bought on eBay. Admittedly, these are probably not as easy to get outside the U.K. but many were published separately in the U.S. and may be available by different publishers. I have tried to give some information about U.S. publications below. In the end I read thirteen of the novels as new translations, six were the Elek Book versions and only one was the Vizetelly translation. Until all the books are available in new translations English readers will have to fall back on older translations such as the Elek Book translations, especially if you’re trying to avoid Vizetelly. I have included as much information as possible on the Elek Book translations below – this information is largely taken from Garden of Zola and from personal copies. I have also included some information, again mostly from Garden of Zola, highlighting the differences between the Elek Book versions and the Vizetelly version. I have limited this to the novels that are, as yet, unavailable in a modern translation. Graham King compares large sections from the books, however, I will limit myself to quoting his summaries and conclusions which are very often amusing and illuminating. Madeleine Ferat (1957) – Madeleine Ferat (1868) translated by Alec Brown. Published in U.S. by Citadel Press, 1957. The Kill (1958) – La Curée (1871/2) translated by A. Texeira de Mattos. Originally published by Lutetian Society in 1895. Includes an introduction by Angus Wilson. Published in U.S. by Citadel Press, 1957. A Priest in the House (1957) – La Conquête de Plassans (1874) translated by Brian Rhys, ISBN 0236309641. Published in U.S. by Citadel Press, 1957. The Abbé Mouret’s Sin (1957) – La Faute de l’abbé Mouret (1875) translated by Alec Brown, ISBN 0236308084, reprinted 1970. Also published as ‘The Sinful Priest’ in 1960. His Excellency (1958) – Son Excellence Eugène Rougon (1876) translated by Alec Brown. Published in U.S. by Dufour Editions, 1958. The Drunkard (1958) – L’Assommoir (1877) translated by Arthur Symons. Originally published by Lutetian Society in 1895 as L’Assommoir. A Love Affair (1957) – Une Page d’amour (1878) translated by Jean Stewart. Reprinted 1972, ISBN 0236309056. Published in U.S. by Citadel Press, 1957. Nana (1957) – Nana (1880) translated by Victor Plarr. Originally published by Lutetian Society in 1895. Restless House (1957) – Pot-Bouille (1882) translated by Percy Pinkerton. Originally published by Lutetian Society in 1895. Ladies’ Delight (1960) – Au Bonheur des dames (1883) translated by April Fitzlyon. Originally published in 1957 by John Calder. Published in U.S. by Abelard-Schuman, 1958. Zest for Life (1955) – La Joie de vivre (1884) translated by Jean Stewart with a preface by Angus Wilson. Reprinted in 1968, ISBN 0236310135. Published in U.S. by Indiana Uni. Press, 1956. Germinal – Germinal (1885) translated by Havelock Ellis. Originally published by Lutetian Society in 1894. The Masterpiece (1950) – L’Œuvre (1886) translated by Thomas Walton. The O.U.P. version published in 1993 is a revision by Roger Pearson of the Walton translation. Earth (1954) – La Terre (1887) translated by Ann Lindsay. This was reprinted by Arrow Books in 1967. The Beast in Man (1958) – La Bête humaine (1890) translated by Alec Brown. The Debacle (1968) – La Débâcle (1892) translated by John Hands with an introduction by Robert Baldick. Doctor Pascal (1957) – Le Docteur Pascal (1893) translated by Vladimir Kean with an introduction by Hugh Shelley. ISBN 0236308602. Published in U.S. by Dufour Editions, 1957. Madeleine Férat – According to King, Brown puts over Zola’s physiological explanations well, whereas Vizetelly makes them even more ludicrous than they already are. Brown’s translation is the best of the three available. A Priest in the House (The Conquest of Plassans) – King quite likes the Vizetelly translation as there wasn’t too much in the novel to annoy the censor. However, the Rhys translation is described as ‘excellent’ and it ‘captures the gossipy flavour of the narrative.’ I enjoyed the book and had no problems with the translation, though this one should be redundant soon as a new O.U.P. translation is coming out. The Abbé Mouret’s Sin – King compares the Elek/Brown translation with a newer one by Sandy Petrey. Although he has qualms about both he admits that both are ‘highly recommended versions’. The original Vizetelly version is ‘as stodgy as a plot of turnips’ and the ‘revised’ Vizetelly was even worse. The middle section of the book is incredibly lyrical, King says that ‘Zola’s linguistic skills are revealed at their peak’ and the Vizetellys weren’t up to the task. This is one of my favourite books of the series. His Excellency – King says that the Elek/Brown version is a ‘craftsman-like interpretation of a straightforward narrative’ and the early versions are ‘run-of-the-mill Victorian mannerist’. This was my least favourite book of the series but I would think that Vizetelly would probably be ok.
A Love Affair – King declares the Elek/Stewart translation as ‘excellent’ especially in relation to the many descriptive passages in the novel. The ‘revised’ Vizetelly suffered quite a bit as they cut a lot out. Zest for Life – King states that Stewart conveys ‘both the sombre atmosphere and the dramatic incidents with equal skill’ and almost approves of the pre-trial Vizetelly version of 1886. However, even here Vizetelly evades a menstruation scene. Further cuts were made in the 1901 version, especially in relation to a particularly harrowing childbirth that takes place in Chapter Ten.I also made some comparisons between the Vizetelly and Stewart translations and was astonished at the differences. For anyone who’s interested you may like to check out this post on this site and my GoodReads review. The amount of culling involved is highlighted by looking at the word counts for Chapter Ten of each version: the original French version had approx. 11,200 words, the Elek version had approx. 11,600 words and the Vizetelly version had approx. 5,200 words. So, avoid the Vizetelly version at all costs! This entry was posted in Émile Zola, Brown, Alec, English, Jonathan (Intermittencies of the Mind), Stewart, Jean, Vizetelly, Ernest A, Walton, Thomas and tagged Émile Zola, Elek, translations, vizetelly. Aren’t those Elek covers deliciously lurid? I have one for The Kill which I just placed in our media library in case you are able to incorporate it into this pic.